Let's claim the record: July is a Perfect Camping MONTH! Tonight will set the record. 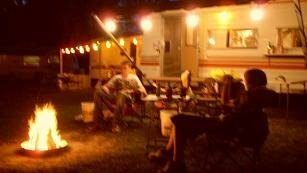 With one more night over over-60 degrees and negligible rain, we'll have a Perfect Camping MONTH for July 2011. Thirty-one days of mostly sun, mere sprinkles of rain, and temps over seventy--the weather camping lovers pray for but rarely enjoy. Campers south of the Mason-Dixon line or west of the Mississippi will only smile and nod at these conditions. They camp under blazing sun for weeks at a time, and worry about the lack of summer rain year after year. Not so in Upstate New York. We expect rain, thunderstorms, sudden wind, plummeting temperatures and sundry unsettled weather. We carry umbrellas and tarps and duct tape for fixing leaks. We pack jeans, sweatshirts and spring jackets all summer long.We just don't get camping conditions like this. Whoever heard of a Perfect Camping Month in NY? We celebrate Perfect Camping Nights--and hope for just one or two on any given excursion. News 8 Meteorologist Stacey Pensgen says we've just had the second-driest July here in Weather History. We nearly set a new mark for consecutive days over-80 degrees. (One day that stopped at 79 broke the string.) It wouldn't be hyperbole to call this month a spectacular one for camping. Of course, our fields and gardens and lawns have suffered. We've watered like never before. Our golf courses are bristly billiard tables. But how can we complain? We're New Yorkers and we don't get weeks like this, much less months. "We wrapped ourselves in blankets around the campfire." Because my wife used to have the first full week of July as mandatory vacation, we've always paid close attention to the way the weather dice rolled for our July camping trips. 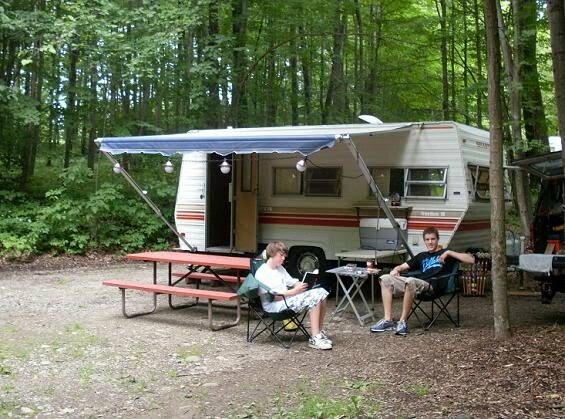 There was the time, about six years back, when we camped at Holiday Hill near Springwater--our favorite. On the second night we had 45 degrees by midnight. We wrapped ourselves in blankets around the campfire. When my family came up for a visit the next morning, we played kickball in sweatshirts and jackets. Three years ago we trekked to the delightful Jellystone of Western NY near North Java. Day one was lovely. Days two through six it rained; the temperature never broke seventy. Good thing our trailer's awning only leaked a little. Another year at Holiday Hill it rained so hard overnight that one of my son's new-found friends had to abandon his tent at two am and seek shelter in another friend's camper. Just last year, on our annual big-group trip to Jellystone of Mexico, just before the giant fireworks in Oswego, the heavens opened up in a deluge worthy of Noah. We learned that even our First-Up shade shelter wasn't waterproof. Trust me, we appreciate this amazing month of Perfect Camping Days. We are pleasantly impressed the even in NY we can have fantastic weather for extended camping trips. We're secretly proud that we've had to squander hundreds of gallons of water to keep our yards alive. It just doesn't happen that way here. For the sake of our struggling economy, I hope the dozens of campgrounds in our region have all set records of their own. This year we camped on the 4th of July weekend at the lovely Cheerful Valley Campground near Phelps (see photo, above). Owner Carl Carlson (a high school classmate of mine) said he would've been 100% booked if he'd had water and electric on his overflow tent-sites. We checked with our other favorite campgrounds, too. Without exception, every one reported "no sites available." We've lost a lot of good jobs here, like so many old-industrial areas have. We've all taken hits of one sort or another from this interminable recession. But for at least this one splendid month of July, New York's tourism trade has shined under the big yellow ball. Our lakes are full of boaters and our campgrounds pleasantly crowded with RV's and tents. Long stretches of sunny days are very good for business. Now our summer is officially half-over. Whaddaya say, August, can you keep the good times rolling? Could we end up with a Perfect Camping Summer? Hey, it could happen!